In 1605 Guy Fawkes attempted to blow up the English Houses of Parliament. It was part of a larger plot by Protestants to overthrow the monarchy but he was caught and tortured until he gave up the names of all his co-conspirators. He leaped to his death just before he was hung, drawn and quartered. King James I ordered the entire country to celebrate this failed coup with bonfires and thus, a national tradition was established – November the 5th, bonfire night, one that is still celebrated to this day. But what if Guy Fawkes had succeeded? What effect would this have had on the development of the United Kingdom and the British Empire? That was the premise Mark pondered and in doing so, he imagined a new alternate history from 1605 to 2018. With the Monarchy overthrown, the surviving relatives of the royal family escaped to Scotland. England became a Republic. The Royal Family in Scotland goes from strength to strength, which inspired the people to come together. This eventually lead to Scotland maintaining its independence. In 2018, England and Scotland are still technically at war, although there’s been no open hostilities for over a hundred years; a bit like North and South Korea. As Protestantism became the dominant religion in England, the hostilities in Ireland never occurred and they became allies. The industrial revolution and English (there’s no British in this timeline) Empire still happened but on a smaller scale and it collapsed sooner. With its focus divided and resources squeezed, England allowed the Colonies to become independent by brokering a 99-year leasing agreement similar to what happened with Hong Kong. England gained some much-needed cash, America gained its independence without bloodshed, it just happened almost a hundred years later. France played a much larger role, establishing towns in both Canada and America. Eventually this lead to the first French American President. England played a dominant role in World War 1, but at great cost, it crippled the economy and never truly recovers, so much so that they declared themselves neutral in World War 2. This isolates England from the world scene and their influence was reduced considerably. By 2018, it is not a United Kingdom but a broken one. With resources dwindling and a tough religious regime in force to control the population, it has a become an isolated island. The short script is set there. It focuses on a French-American business man visiting England on his first trip outside of his own country. He truly feels like a stranger in a strange land. Matters take a turn for the worse when he accidentally utters a word that has recently been banned. Facing incarceration in the Tower, he is forced to go on the run with a couple of eccentric Scottish freedom fighters. 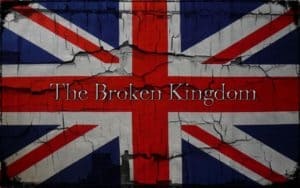 Partially inspired by Brexit and V For Vendetta, The Broken Kingdom is a dark comedy, which mixes serious elements with funny, yet tragic situations. This entry was posted in script and tagged short script. Bookmark the permalink.